Gorgeous, isn’t it? This is Eccremocarpus scaber ‘Tresco Red’. 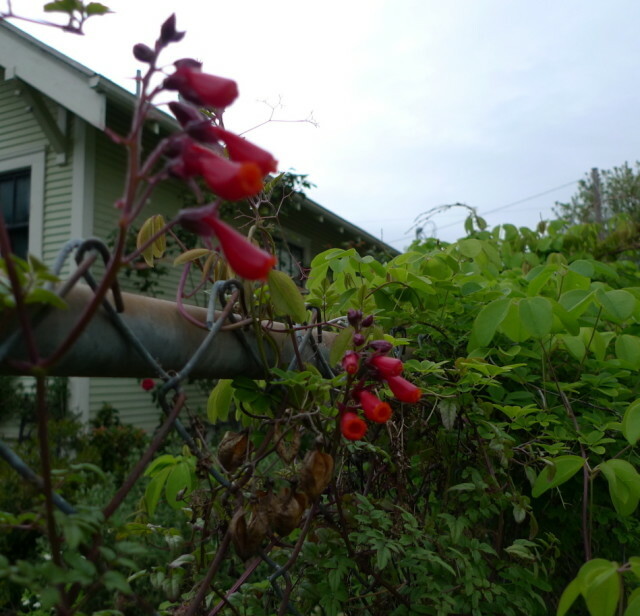 If I ever doubted the hardiness of the Chilean glory vine (Eccremocarpus scaber) before, that doubt has been wiped away by this tough little vine’s luscious, sorbet-red flowers, which appeared last week… just a few months after my garden reached 9 degrees F for a few consecutive nights this past December! Eccremocarpus (say "eh-crema-car-puss" – why not use botanical Latin? Geeks are very attractive, you know…) is rarely seen in gardens yet is very easy and quite spectacular in flower! This reputedly tender little vine covers itself in hot red, orange or yellow tubular flowers that are beloved to hummingbirds. The plant can quickly envelop a trellis yet is well-mannered, topping out at just 8 – 10 feet. It has elegant, lacy foliage with small tendrils that gently insinuate themselves through chain link fencing, a trellis, or over a wooden fence. As with most vines, Eccremocarpus is happiest with its roots in shade and top in sun. It seems to flower continuously from spring to fall in a nice, warm position (it loves a warm spot in the garden), as long as it receives consistent water and is planted in rich, well-drained soil. And while this reputedly tender vine is only hardy to 15F (fine for most "typical" Portland winters), it might just surprise you by surviving if its roots are well-established before cold weather hits. It’s usually found in the "Annual Vines" section of retail nurseries. I saw it at the Portland Nursery yesterday for about $6 in yellow, orange and red. Apparently there’s a pink form, which I have never seen. If you find it, or have it, let me know! You can also buy Eccremocarpus on line from Annie’s Annuals.